The federal government has confirmed Badgerys Creek as the site of a new, second airport for Sydney, Prime Minister Tony Abbott and Deputy Prime Minister and Infrastructure Minister Warren Truss announced today. “The government has confirmed that the site for Western Sydney’s new airport will be Badgerys Creek,” the Prime Minister said. Construction of the new airport could commence as soon as 2016, the Prime Minister said, but it won’t be operational until the mid-2020s, according to a Department of Infrastructure fact sheet released with the announcement. “The Australian government estimates that the airport could be ready to take its first flight in the mid-2020s,” the fact-sheet reads. Before construction of the new airport can begin, the federal government has to enter into discussions with the owners of Sydney Airport, which under the privatisation agreement for the sale of Australia’s busiest airport has first right of refusal over the development of a second airport within 100km of Sydney Airport. “Sydney Airport has a Right of First Refusal which sets out a detailed process that will be worked through as and when appropriate. In the meantime, we will continue to engage in constructive discussions with the federal government,” Sydney Airport noted in a statement. The government has also flagged that the cost of developing the new airport would be largely borne by the private sector. “There will be some expense to the Commonwealth in terms of planning and design, but the $2.5 billion – which is widely quoted as the cost of building the airport itself – is something that will come from the private sector,” the PM told media. Qantas was quick to welcome the announcement: “Qantas has long supported the building of a second airport at Badgerys Creek, as have a number of detailed studies. After decades of debate, we applaud today’s announcement by the Prime Minister,” CEO Alan Joyce said in a statement. As someone who lives in Sydney’s west, I’d be very interested to see what road and rail links and other infrastructure they have planned and, more importantly, actually underway before I get too excited about Badgery’s Creek. Unfortunately if the NSW govt has anything to do with the road and rail links it will involve multiple reviews and eventually end up being a single rail line with station access charges and a two lane road with a toll. All of this will of course run late meaning that for the first few years you’ll have to walk across a few paddocks to get to the terminal to board your flight. Have any airlines, whether international or domestic, showed any intrest in this airport? How many years ago was that photo of Bob Collins, Transport Minister, standing beside the Badgery’s sign, turning the first sod with the silver shovel? 25? 30 years ago? Have to ask the obvious question here, as much as land based infrastructure and transport networks are important for this project, what about aircraft transit patterns? ie. The Bankstown Lanes of Entry? two Class C airports with jets departing constantly within 25nm of each other, isn’t going to leave much room for any GA aircraft to buzz in and out let alone the Bankstown/Camden training area and the future for Bankstown and Camden. News of decade! Congratulation to Tony Abbott and His government. After saga of 40 years, time for joy! HAPPY EASTER 2014 to all people in aviation, to all of good will. Soon my landing down under. So happy day today. Greeting from Serbia. Rod. Marinkovic, AME (ret.) KRALJEVO / SYDNEY. Build it bigger than necessary from the start, and make sure access is from multiple directions (to avoid the access mistakes evident in other projects like the Sydney Olympic Park). Don’t fall into the trap of thinking that all traffic will come from the northern side via the Great Western Highway – it will probably come from every direction other than the south west, and will need easy and generous access from all those directions. The London Olympic planners realised this to be one of the greatest follies at Homebush. The roads should be 4 lane divided with graded interchanges – the cheapest it will EVER be to put in 4 lanes and graded interchanges will be when it’s still a greenfield site. After that it will take traffic control, incur delays, and require all the construction assets to be re-massed. The rail line should have a reservation adjacent to allow for increased rails and a maintenance access that does not interfere with road access now or in the future. Rail freight interchange might make it more immediately viable. Again the cheapest it will EVER be is right now as a greenfield site. The inevitable business parks should be kept well away from growth areas (airport, runways, & access routes) and should have access that is predominantly independent of the airport access routes. (Brisbane made a large mistake with this, and eventually caused so many problems that it required a complete re-alignment of the Gateway Mwy amongst a raft of changes). Unfortunately a curfew would probably reduce the utility of the airport hugely. Right now Sydney is the missing link in the East Coast airports enabling red-eye and heavy freight operations. Timeframes on construction are a little puzzling, unless they are all predicated on having the supportng infrastructure requirements synchronous to the air-side requirements. 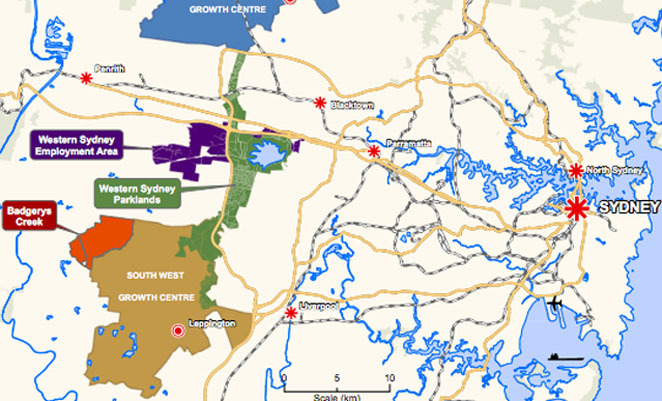 Wagners is building a greenfield site over 24 months in Toowoomba, so 7-10 years is not exactly working fast. Well the currently liberal government has had recent success in bringing down the cost of the SWRL under budget and having it 12 months ahead of schedule. The NWRL is already 3 months ahead of schedule. The airport is the catalyst for a whole bunch of federally and state funded projects including rail and road. Hopefully detailed planning will be available shortly. We maybe in peak oil but there are other options for fuel including a new aviation bio fuel that has already been tested. The amount of people who think that aviation will end once fossil fuels are gone is absurd. New technologies will evolve and better efficiencies of current technologies in the automotive sector will extend the oil availability for aircraft. @Dane – they’ve had the site for close to 40 years – one would have thought that most site testing was well advanced. For a complex airport like this, MOS 139 is a nightmare to comply with. As Dane said, flattening the ground to ensure slope and gradient compliance for taxiways and runways will keep them busy for a very long time. For certification purposes, it is going to take up a lot of the ten year window allocated to the first stage. It will be very interesting to watch this progress. By only committing to one runway instead of committing to a primary port of entry with two runways it could end up like Avalon. Too far away from the major population and too close to an existing primary airport. I can see the Victoria and New South Wales state governments end up subsidising Jetstar to fly Avalon to Badgerys Creek. what – they couldn’t find a big FLAT piece of ground ??? ?